Special thanks to Rod Byatt for offering to host March's USK SYD event in St Peters. Sydney Park is like no other park in Sydney (its stark contours are used for tv adverts) and the Graffiti Zone is not to be missed - it is the best in Sydney and amongst the work are examples by artists who have gone on to become international prize-winning artists outside the graffiti field. I personally don't know this area well and whenever I drive past the bricktowers of Sydney Park have always wants to stop and sketch…so very excited at this chance to have an opportunity to do so. Meeting Point: The meeting point at 9.30am is the Sydney Park carpark off Princes Hwy, Note: The carpark is nearly full by 8.45am on Saturdays given the popularity of the park, so arrive early or look for street car parking in nearby St Peters or the carpark off Sydney Park Road. (2) spend half the time at the brickwork towers/Sydney Park and half at the May Lane graffiti zone. 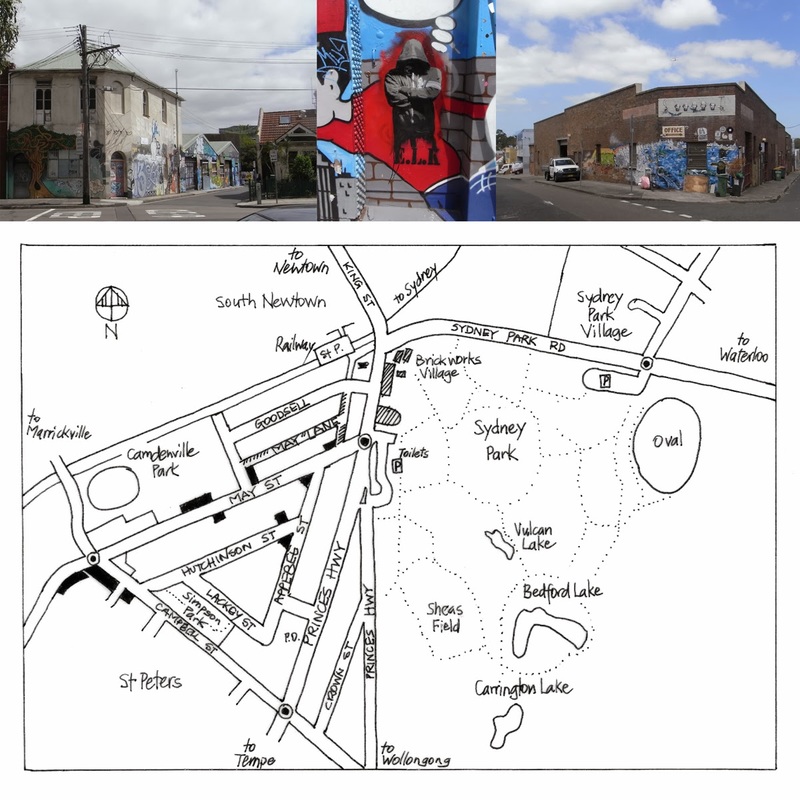 If anyone's interested in more sketching options than just the bricktowers and park, they can join Rod on a quick 20min walking tour (9.40-10.00am) covering the local built environment in nearby streets (pointing out subject matter used by other artists), ending up at the graffiti laneway and Sydney Park. This will be a quick walk-around with no time for sketching: individuals can return to locations if they want - they're all just 5mins away from the Brickworks. Please note: Sydney Park is very exposed so please bring adequate sun protection(sun screen, hat etc) and your own seating! 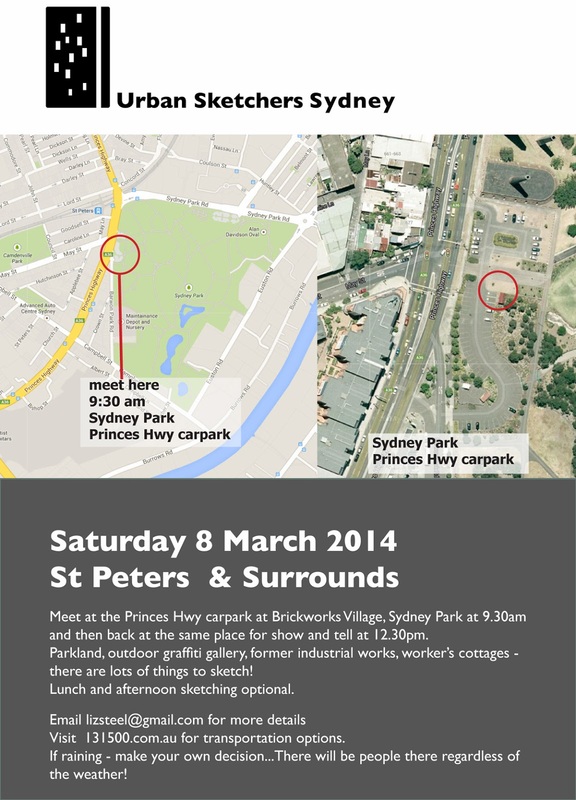 If you’re heading to the park by public transport, St Peters train station is just across the road. There are also a few bus routes that stop nearby, such as the 370 and 422. Look for routes that travel down Sydney Park Road, Princes Highway and King Street. Three car parks are available but as mentioned above fill up quickly. Everyone is welcome - no need to RVSP. Please invite anyone else you think might be interested. Mark the date: Saturday 21 March we are planning an evening public sketching event at Cockatoo Island 4.30-7.30pm at the end of the Expressive Urban Sketching 2 day workshop. It will a be great opportunity to sketch the island, visit the Biennale exhibitions and meet other sketchers that are visiting for the workshop. We have people coming from regional NSW,Victoria, South Australia, Queensland AND Canada coming - not to mention the guest instructor Paul Wang from Singapore. More details will follow shortly.